In The Wind Through the Keyhole, Stephen King returns to the rich landscape of Mid-World, the spectacular territory of the Dark Tower fantasy saga that stands as his most beguiling achievement. Roland Deschain and his ka-tet—Jake, Susannah, Eddie, and Oy, the billy-bumbler—encounter a ferocious storm just after crossing the River Whye on their way to the Outer Baronies. As they shelter from the howling gale, Roland tells his friends not just one strange story but two . . . and in so doing, casts new light on his own troubled past. I was very excited to go back into Mid-World and see the great ka-tet again, so I had high expectations for the book, but they weren’t really met. Jake, Eddie, Oy, and Susannah were only in the very beginning and then it went to a story within a story, and then a story within THAT story. Learning about younger Roland was interesting, but that wasn’t even the bulk of the book. Most of the book was a story Roland was telling a young boy in the storying his was telling the ka-tet. The story was not bad. It was a good story that you could imagine being passed down from generation to generation. I enjoyed it, but it wasn’t up to par with the other books in the series or the story of Roland. It was also confusing at times, it should have been a little longer because there were some scenes that seemed rushed. Not to be too down on it because I did enjoy it, I just wish it had been better! If you like the series, you should read this book! So how did your long weekend go? Mine was really good – it felt MUCH longer than four days, which I won’t complain about. Getting up early tomorrow will be hard! I didn’t get as much reading in as I wanted to, but I did finish three books! I read The Wind Through the Keyhole by Stephen King, the Dark Tower book. I will write a full review later, but it was good! It was fun to be back in that world. I also read one book for work, that I really look forward to others reading. I also read From the Memoirs of a Non-Enemy Combatant: A Novel by Alex Gilvarry. I will write a full review of that later this week also, but it is a clever and creative book. I highly recommend it. Did you get any reading done over the long weekend? Thankfully Reading Challenge and Update! How is everyone doing so far? i have finished two books, I was up until 1:30 last night finishing one. Hoping to read at least two more this weekend! Anyone else veture out yesterday? We went to the mall around 1 and I finished four people for a great price, so it was worth it. We also went to Target last night because I needed gummy bears to infuse with vodka for a party next week. Neither were that bad. Do you have any special family memories/traditions involving books? I have so many! My mom is a teacher and really encouraged us to read a lot. I want to share a couple special memories. We went to the library all year long and were always getting books out, but during the summer we would g oa little nuts. We would get to the library, spend 20-30 minutes and each come out with a stack of books – I usually had at least ten. And we did this every other week. It would be a common thing to see us sitting outside or in the living room and reading. She tells me she and her mom were the same way. The tradition is one that is still special to me. Things will be a little different this year, but growing up we would go to church and dinner on Christmas Eve. When we came back, there would be a book and pajamas under the tree. They were the only presents that we would open that night. We still each get a book, but now we can’t really read them that night because they are too long! Another last really fun memory. My mom and I both loved Harry Potter before it was huge, so we had been waiting for the fourth book for a long time. It was the first time Amazon guaranteed delivery that day it came out, so we were both listening for the mail truck. My mom was in the backyard and I saw it get to our house. I ran to the mailbox and the mail man handing me the mail. I was running to the house with the book and my mom must have heard the truck also and came running into the front. There was a little bit of wrestling for it, but she ended up letting me read it first. It is just a rally fun memory with my mom! Do you have any great bookish memories? This year we are going to a buffet with two of our closest friends then playing games at our house. We wish we could spend it with or families, but it doesn’t always work out. I am really looking forward to spending it with our friends for the third year in a row. They are great people and I am so thankful for them! What’s in your TBR pile for the weekend? I have two other work books and a couple of civil War books I want to start! How much time do you think you’ll have for reading? What book are you starting out with? Are you reading print, ebooks, or audio? Maybe a bit each? Looking forward to the challenges! In a sleepy little New England village stands a dark, weather-beaten, many-gabled house. This brooding mansion is haunted by a centuries-old curse that casts the shadow of ancestral sin upon the last four members of the distinctive Pyncheon family. Mysterious deaths threaten the living. Musty documents nestle behind hidden panels carrying the secret of the family’s salvation—or its downfall. This was my next book for the 1001 Books You Must Die Challenge…and it took me three months to read it. I didn’t hate reading it, it was just SO slow. For most of the book, nothing happened. Nothing at all. I thought I would really enjoy it since The Scarlet Letter was one of the best books I read in high school. I loved everything about it. This was the opposite. The only things I liked about the book was Phoebe and the end of the book. She was the one light in a slow and rather boring book. It did get much better at the end, but it wasn’t worth the long and slow journey. They can’t all be winners, i jsut hope the next one doesn’t take me so long! Hospitalized with a freak case of tropical pneumonia A.J. Jacobs felt compelled to change his ways and get healthy. And he didn’t want only to lose weight, or finish a triathlon, or lower his cholesterol. His ambitions were far greater: maximal health from head to toe. I have read all of Jacobs books and they are always entertaining. This was no different. 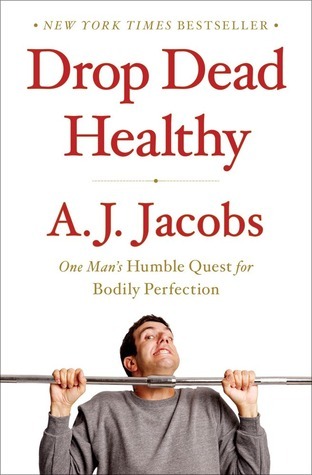 Jacobs spent two years trying to be the most healthy human. He looked at everything from his ears to his stomach to his feet and everything in between. He went to some extremes that most of us won’t do, but there are a lot of great ideas and tips. And plenty for you to think about. I know my next trip to the grocery store will be very different! I am walking differently and even brushing my teeth differently since reading the book. What he did was a little unattainable, but I am trying to get up more while at work so I am not sitting for eight hours a day (it is really bad for you to sit that long). I wish I worked somewhere where I could use a treadmill desk. it also makes you think of great ways to control portions or keep yourself for eating things you know are addicting. Mostly it just makes you think about how amazing the human body is and how you can take care of it as best you can. It looks at some of the more extreme practices in a balanced way. He is willing to try anything. It is another great book from Jacobs and I highly recommend it. THankfully Reading Weekend Sign Up! 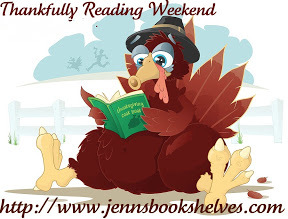 This year, Jenn at Jenn’s Bookshelves is hosting Thankfullly Reading Weekend, November 22-25! Jennifer from Literate Housewife is co-hosting! I was trying to decide if I was going to participate or not…and then I put the fifth book onto my currently reading shelf on goodreads and got a few more books to read for work. It seems like I need to join in the fun and I am really looking forward to it! I hope to finish up all the books i need to read for work. You should join in too! I just started a book club within another group I am in and this was the first choice. The book club actually talked about the book, os that is always a good sign! I can’t go next month because that is the day we are celebrating the holidays with my husband’s family, but that is okay because they are reading a religious holiday book and I really don’t want to read it. Unfortunately, I did not really care for the book. 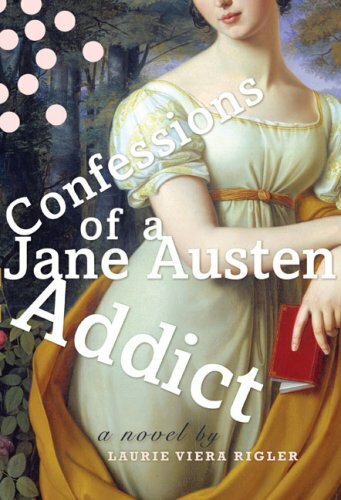 I was excited to read it since I read and liked my first Austen book this year and have been enjoying watching the Youtube series The Lizzie Bennett Diaries. But if you are a Jane Austen fan, watch out, this is nothing like I expected. My problem was Courtney. She is supposed to be obsessed with Jane Austen, yet she seems to not understand the time period at all. She goes on modern feminist rants and does so many things that could really ruin Jane’s (the person she is in) life. She should know that you can’t spend time alone with a man without it looking suspicious and starting gossip. It was so frustrating. It got better as it went on, but a Jane Austen addict should get it! I also got very annoyed with the language, she kept using modern language throughout. The worst was all the times she said “Whatever” to her mother. That does not fit in the time period! At all! It was not just that word, but the spoke differently and it wasn’t there. Courtney was just kind of annoying. She wasn’t a very good friend or a good judge of people. I thought she spent a lot of time whining about her ex-fiancee and trying to relate others to him, even if they were nothing like Frank! She wouldn’t open her eyes to anything, which was disappointing. That said, I loved her friend Mary. She was the perfect 19th-century woman, a great friend, and it felt like she was a character from a Jane Austen novel! I loved the concept, but it just didn’t really work for me. I want to check out the reviews for the companion novel though, it is Jane in Courtney’s world. It could also be fun. Timothy Wilde tends bar near the Exchange, saving every dollar and shilling in hopes of winning the girl of his dreams. 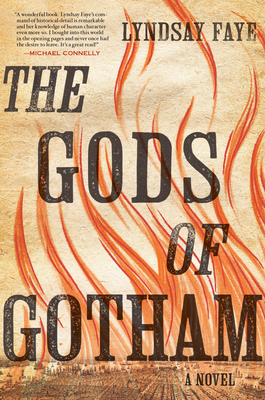 But when his dreams literally incinerate in a fire devastating downtown Manhattan, he finds himself disfigured, unemployed, and homeless. His older brother obtains Timothy a job in the newly minted NYPD, but he is highly skeptical of this untested “police force.” And he is less than thrilled that his new beat is the notoriously down-and-out Sixth Ward-at the border of Five Points, the world’s most notorious slum. One night while returning from his rounds, heartsick and defeated, Timothy runs into a little slip of a girl—a girl not more than ten years old—dashing through the dark in her nightshift . . . covered head to toe in blood. Timothy knows he should take the girl to the House of Refuge, yet he can’t bring himself to abandon her. Instead, he takes her home, where she spins wild stories, claiming that dozens of bodies are buried in the forest north of 23rd Street. Timothy isn’t sure whether to believe her or not, but, as the truth unfolds, the reluctant copper star finds himself engaged in a battle for justice that nearly costs him his brother, his romantic obsession, and his own life. This has gotten some amazing reviews, and I have been in the mood for a great historical mystery lately. I am so glad I picked this book up! It had everything you want in a historical mystery! Setting: The setting was vivid and stunning. Everything sounded like it was from the 1850s, from the clothing to the language. Faye did an extraordinary job of makign it feel and sound like a time period much different from our own. It made me very grateful to live near NYC now and not then! Great Characters: Timothy might not see himself as a natural copper star, but it is obvious to the read from the beginning that he is going to be an excellent one. He is smart and thinks quickly. He is very observant. He is kind and cares about the people he lives with and around. 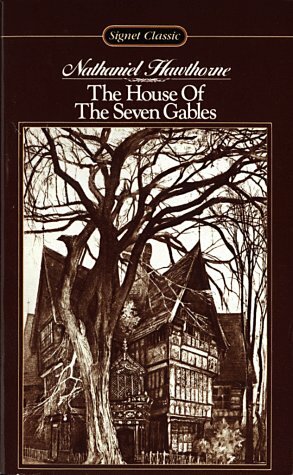 A Great Mystery: The mystery of this book is one of the best. It is exciting, but not so exciting that it feels like things happen too quickly. Almost no one is what they seem, and not just to Timothy. There are so many different possibilities for the murderers and motivations that you never quite know what is going on. Yet in the end, it all makes sense and it isn’t a bunch of coincidences. If you are in the mood for a mystery, this is a great choice! If the summary sounds like something you would like, you probably will really enjoy it. I have been reading so many fantastic book lately! When 16-year-old Tessa Gray crosses the ocean to find her brother, her destination is England, the time is the reign of Queen Victoria, and something terrifying is waiting for her in London’s Downworld. Only the Shadowhunters, keep order amidst the chaos. Kidnapped by the mysterious Dark Sisters, Tessa soon learns that she herself is a Downworlder with a rare ability: the power to transform, at will, into another person. What’s more, the Magister, the shadowy figure who runs the Club, will stop at nothing to claim Tessa’s power for his own. AFter I caught up with The Mortal Instrument Series, I wanted to read the prequel series. I didn’t know what to expect, but I was pleasantly surprised! I thought it was really cool to look at Shadowhunters in the past when gender roles where much, much different. Tessa’s shock at women wearing pants, let alone fighting Downworlders. Though even in the Shadowhunter world, women are looked down on by many. Downworlders seem like they are in view more than they are in the more modern series, but they are still as complex as the main characters. This book was just as exciting as the others. There were twists and turns, but one of the major ones was very predictable, which is always a disappointment. Though it was predictable at time, it was stilla very fun book to read. It was especially fun to see the characters that we know from the original series, especially Magnus Bane. It helped the reader understand him and his reluctance more. It also was fun putting the pieces together as the book went on. When the “oh” moments hit, they were fantastic. 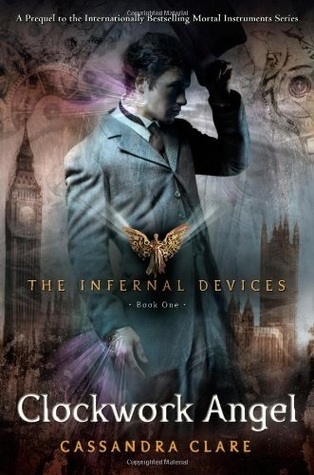 If you are looking for a fun series, this is a great addition to The Mortal Instruments. It isn’t the best series out there, but it is a fun one!